About Grand Bahama Island - Mosko Realty Ltd.
Grand Bahama is the most northern of the Major Bahamian islands and lies just 75 miles off the coast of Florida. Freeport has easy access with numerous flights to the Miami area as well as flights to other American cities and some European cities. Grand Bahama is about 75 miles long and 4 to 8 miles wide. There is little elevation and the highest point is only 68 ft. making it one of the flattest islands in the archipelago but it is the second largest island. Freeport, on Grand Bahama, was developed in the 1950s by American business interests and is now home to a number of US commercial enterprises. Wallace Groves founded the Grand Bahama Port Authority, which was granted Crown Land and taxation concessions in return for developing the land, building schools, dredging the harbour and building an airport. The Port Authority, now run by British, Canadian and American investors have gone into partnership with Hutchison Whampoa. Banking and financial services are vital to the economy. 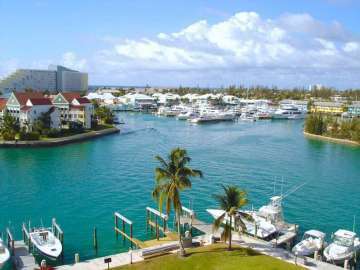 Favorable tax laws have made the Bahamas an international banking center. Grand Bahama is well known throughout the world for its industrial industry. Western Hemisphere, Grand Bahama has the largest Shipyard servicing the major cruise lines, the largest container port and is a major transshipment hub for the americas and also has the largest storage terminal facility in the Caribbean, with the ability to store, blend, transship, and bunker fuel oil, crude oil and various petroleum products. All of these plus other large scale industrial companies make the industrial industry the number industry for Grand Bahama and tourism is our second. Grand Bahama is unique to all the other islands because The Grand Bahama Port Authority Ltd. operates the Free Trade Zone under special powers conferred by the Government under the Hawksbill Creek Agreement, which has been extended until August 3, 2054. There is no income tax and no capital gains or inheritance taxes. The government raises revenue through selective taxes such as hotel occupancy tax, restaurant service charges, custom duties, departure tax and value added tax (2015). In the Freeport area one can find all the conveniences of a city while being only minutes from beautiful uncrowned white sand beaches and a short drive to “Out Island life”. Freeport is the most American of any location in The Bahamas because it was a planned city and laid out accordingly and it is maintained and governed by The Port Authority. Grand Bahama is a duty free zone and there is no property tax, unlike the other islands. Grand Bahama is ideal place for those looking for a relaxing small city with fast access to USA. Grand Bahama is very near to Florida so travel back and forth for the residents is a common thing. It’s a short 20 minute flight to Miami or an overnight ferry to Fort Lauderdale. It has a world class International Airport and a Private Terminal for private planes and charters.